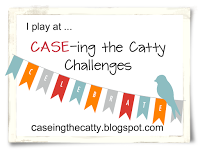 This week the Team at CASE-ing the Catty are focusing on cards featured in the Holiday Catty. I have curled each layer of the poinsettia blooms & added some gold glitter ink to the stamens. A tiny rhinestone, coloured with the darkest daffodil blendability completes each flower. I also coloured some white baker's twine with the lightest cherry blendability for the bow. The brushed gold watering can is popped up on dimensionals & layered over a strip of striped sticker from the retired Season of Sweets Designer packaging kit, as well as a garden green strip. A simple embossed border finishes off the card. You can see all the fabulous inspiration pieces by the Design Team & play along in the challenge here (click on the graphic).